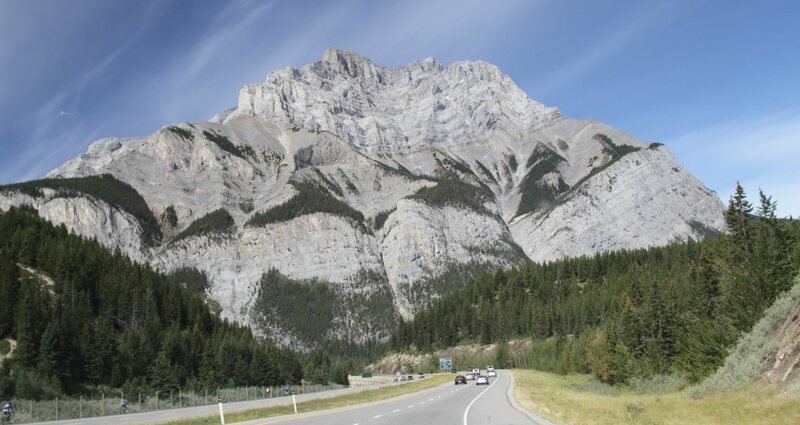 The drive from Calgary through Banff to Lake Louise westbound on the Trans-Canada Highway is a scenic tour that attracts people from all over the world. The drive only takes two hours, but is best spread over at least a full day, allowing time to stop often for photos, hikes and wildlife viewing. 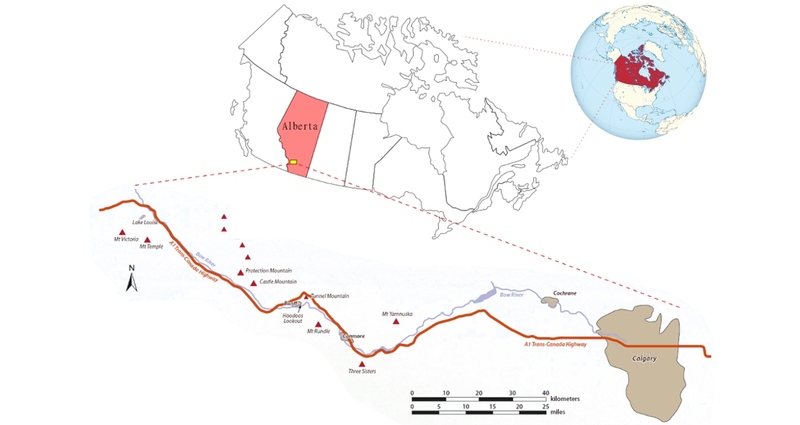 Location map showing the area discussed in the article, from Calgary west through Banff along the Trans-Canada Highway, and then north to Lake Louise. 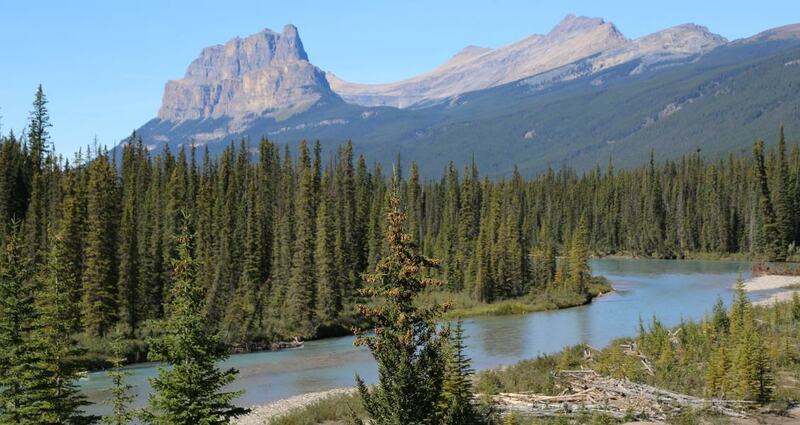 The long narrow ranges of the Canadian Rocky Mountains extend from the US border in the south and trend northwest for almost 1,500 km following the Alberta-British Colombia (BC) border before crossing it and terminating just shy of the BC-Yukon Territory border. It is a narrow range up to 180 km wide at most, and was created by thrust faulting from west to east, where older Cambrian rocks were thrust up and over younger Mississippian and even Cretaceous rocks. Thrust faults occur in fold and thrust belts, which are associated with periods of mountain building due to colliding plates, and foreland basins form at the edge of the plates, where they collect sediments shed off the newly accreted mountains. Thrust faults respond to pressure and propagate laterally and upward through previously deposited sediments in the area. Thrusting upward through time, they always result in older over younger rocks. The areas of movement are usually along weaker shales and the uplifted rocks often form resistant cliffs, while the shale-filled valleys deepen as a result of glaciation and water erosion. In the Rocky Mountain belt the thrust faults run north-east to southwest and are generally hard cliff-forming carbonates from the Cambrian, thrust up and over soft clastics from the Mesozoic. While the valley with the clastics erodes ever deeper, the resistant carbonates remain high, so the difference in elevation between cliff peak and valley bottom is greater now than when they were formed. Bow Valley Parkway facing east and the Livingstone limestone of the Sawback Range. The wooded mountainside’s mark the height of the ice in the valley during the Late Wisconsinian glaciation, about 2000m elevation, or 600 m thick in this valley (Gadd 2008). Complex folding and faulting is associated with the thrust faults, including drag folds and break thrust faults where the anticline/syncline pair rupture, leaving steeply dipping formations falling off in either direction. As a student, the idea of thrust faults and plate tectonics was a concept introduced by the professors, but perhaps interpreted somewhat skeptically by the student. One memorable spring day, our third year class was at Lake Minnewanka, near Banff, on a day trip to see local rocks in the area. The lake was still covered by a thick layer of softening ice when suddenly a strong wind blew up the valley. The force of the wind blew on the ice floes (the ‘continents’) overlying the lake water (the ‘molten core’) which hit and rode over each other, creating ‘subduction zones’ as well as simulating thrust faults as the moving ice ‘continents’ met with the resistant ‘land’ masses; both plate tectonics and thrustfaulting were demonstrated convincingly to a very lucky geology class. Stratigraphy of the Canadian Rocky Mountains in the Banff area. Let’s take a look at the general geological setting of Canada. In a nutshell, where the central craton of the continent is exposed in northern Saskatchewan, Manitoba, Ontario, Quebec, Nunavut and the Northwest Territories, it is called the Canadian Shield. The gneisses underlying the Rockies as basement are of this same Archean age and are part of the craton. The shield area in the Archean was located in the southern hemisphere, and was a mountainous uplifted area, which shed sediments towards the future interior plains and Rocky Mountain area site. 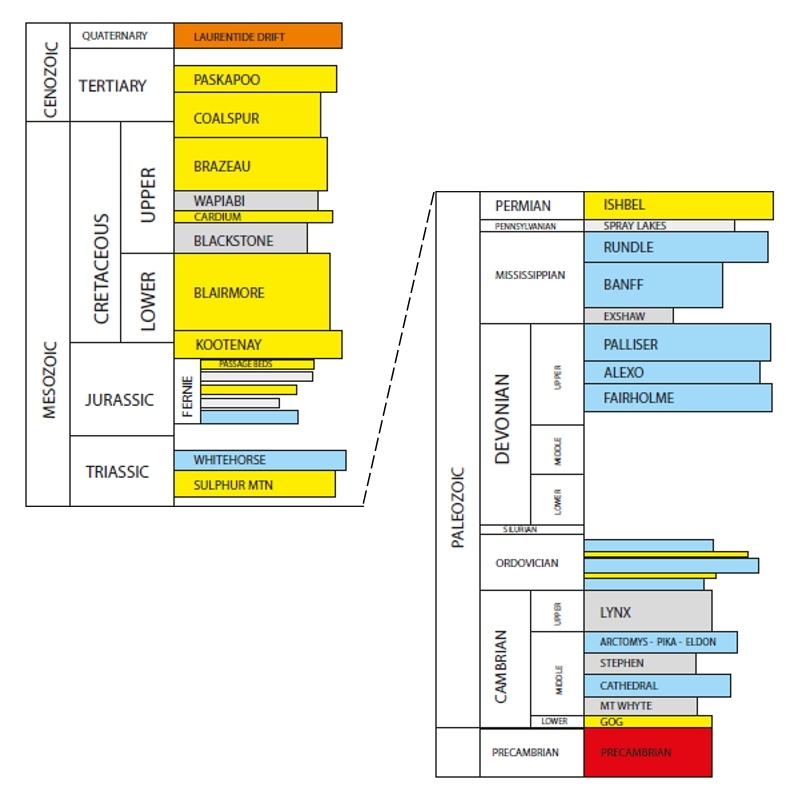 At times underwater, most notably during the Cambrian when the famous Burgess Shale was deposited, and at other times exposed, for example during the Silurian, the sediment layers built up, consisting mostly of shales and carbonates interlayered with some quartz sandstones and silt layers. Of economic importance today, during the Devonian a significant warm inland sea developed, making for reef deposits that later became viable oil and gas producing formations in Alberta. There is evidence of glacial activity as well, in the Proterozoic and Carboniferous as well as the most recent cyclic Neogene and Quaternary glacial episodes. The last glaciation in the area was the Wisconsinan, which brought the Cordilleran ice sheet, probably 1 km thick, over what is now the city of Calgary between approximately 31,000 and 14,000 years ago. In fact, Nose Creek in Calgary is believed to mark the place where the Cordilleran ice sheet from the mountains met the Laurentide ice sheet from the Canadian Shield. 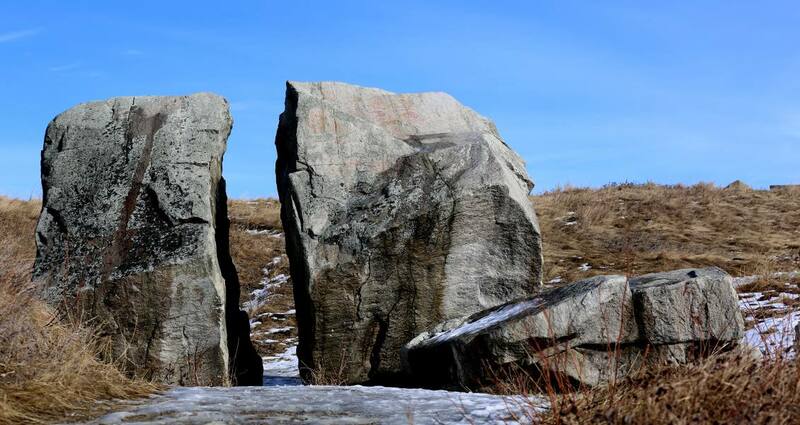 In north-west Calgary’s Confluence Park there is an erratic, which was carried more than 400 km from Mt. Edith Cavell in Jasper. Drumlin seen from the TransCanada Highway #1 driving through Morley Flats. These glacial features indicate the direction of ice flow from left to right in the picture. Calgary is built on glacial till from the aforementioned ice sheets. The Paskapoo Sandstone lies beneath the till, and rocks from this formation are visible in the old downtown sandstone buildings and also the huge boulders used extensively as retaining walls in the newer residential areas of the city. As the great ice sheet receded, Calgary’s Glacial Lake came into existence, and up to seven lake terrace levels are visible in the Bow Valley today. As you drive west of Calgary, on the 1A highway, near Cochrane you will have a nice view of the lake terraces. After the ice sheets withdrew, the Bow River set its present-day course and ultimately empties into the Hudson Bay, over 1,000 km to the north-east. 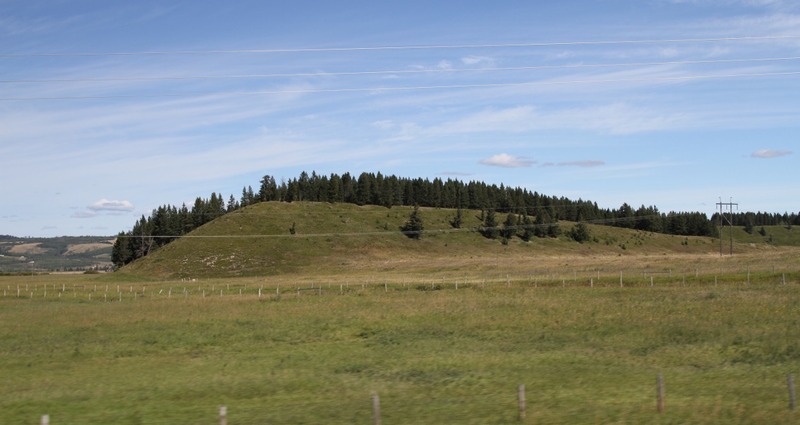 Continuing west along the TransCanada Highway, we know we have entered the foothills belt of the foreland basin when we begin to see southwest tilting rocky outcrops on the side of the road. The first thrust fault is approximately 30 km west of Calgary and we will cross 31 faults on our journey. Mt. 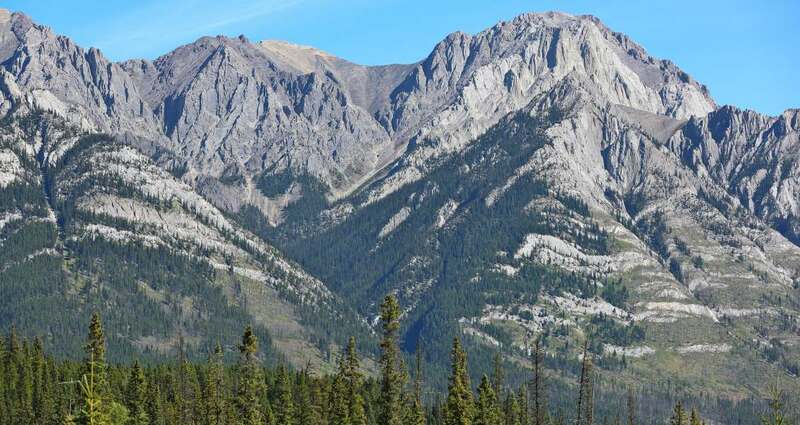 Yamnuska, seen on the right-hand side of the highway, is the first mountain that you meet, and it shows the McConnell Thrust fault clearly near the top of the talus slope, where the middle Cambrian Eldon Formation lies on Cretaceous Brazeau deposits. Mt Yamnuska, Cambrian on Cretaceous. The cliff forming Cambrian Eldon formation rides the sharp line of the McConnell Thrust Fault to overlie the Cretaceous Brazeau formation seen on the treed slopes. Detailed view of the sharp line of the McConnell Thrust Fault. 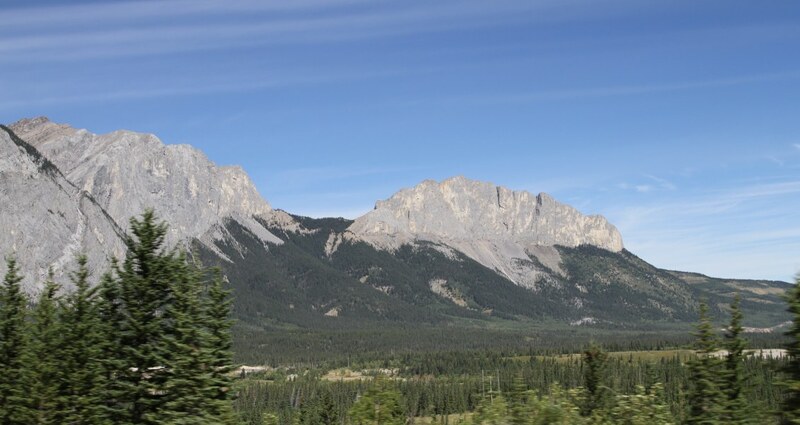 Driving up the valley towards Canmore, on the left-hand side of the highway roughly at the tree line, the Rundle Thrust fault has pushed up cliffs which comprised the typical front ranges ‘sandwich’ of uppermost Rundle, Banff and Palliser Formations, overriding the Fernie shale. Continuing along the Bow River to the lookout point at the Banff Hoodoos, approximately a kilometer outside the town of Banff, one can see a thick section of glacial deposits in the valley. The current analysis suggests these formed from a debris flow created by a glacial ice dam from a valley in the area, which, as the ice receded, allowed for a Jokulhlaup-type debris flow. This flow is homogeneous in nature and similar to glacial till, but will also include some layering of lakebed alluvium: the layering indicates a debris flow rather than till, which would be completely homogeneous. 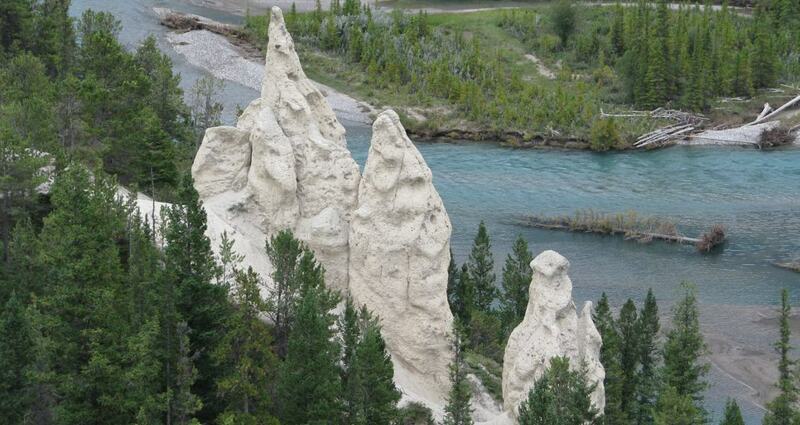 As the river etched its way through the loose deposits the soft sediment eroded, but areas capped with harder rocks resisted erosion, resulting in distinctive pillar-shaped structures, known as hoodoos. Cascade Mountain, overlooking Banff, is also made up of the typical Rundle-Banff-Palliser package, and shows a gentle curve between the layers, showing the powerful folding forces that occurred during the thrusting. Mt. Rundle, about seven kilometers south-east of Banff, is named after the cliff-forming Rundle Formation found on its peak and is often shown in tourist brochures of the region. 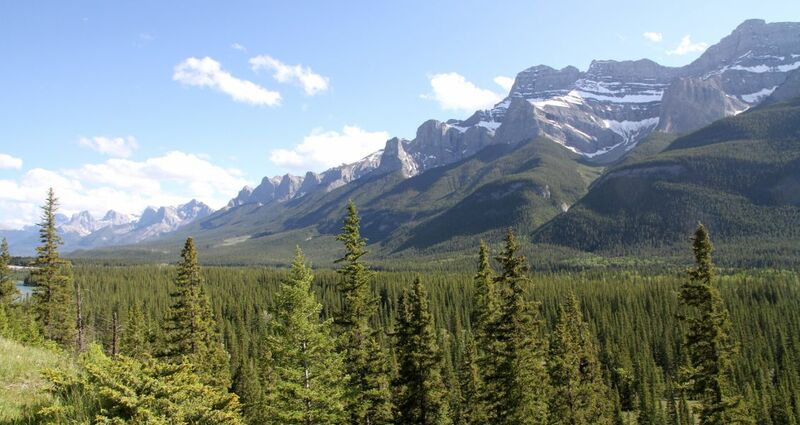 Adjacent to the Banff town site, the stubby nature of the equally famous hill called Tunnel Mountain owes its shape to glacier ice, which rode right over the top of it, leaving it rounded on the side the glacier approached and cliffy on the other side. Of interest as we continue the drive up the Bow Valley are the Jurassic and Cretaceous Kootenay Formation’s Passage Beds. They mark the transition from sediments being derived solely from the eastern Canadian Shield to those resulting from off the new mountainous area to the west, created as the North American continent collided with western terranes as Atlantic seafloor spreading propelled the plate west. The Passage Beds themselves are composed of siltstones with thin planar rust-weathering sandstones deposited onto the largely deep-sea shales. 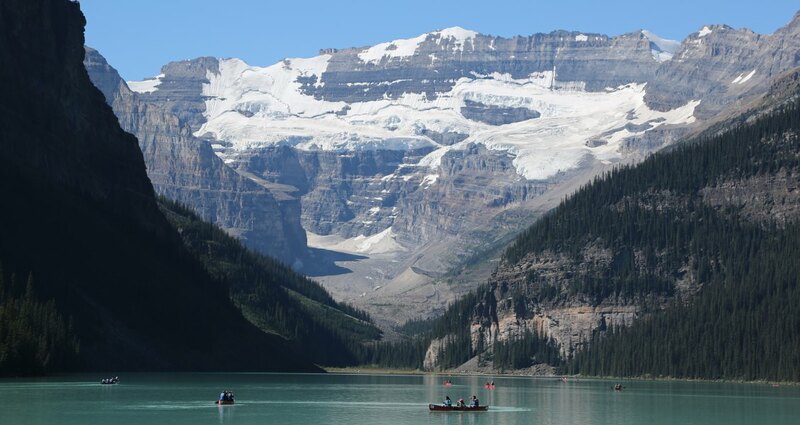 Lake Louise, Alberta with Mt Victoria showing the carbonate Eldon Formation underlain by the Stephen shale, carbonate Mt Whyte and Cathedral formations and the Gog Group. 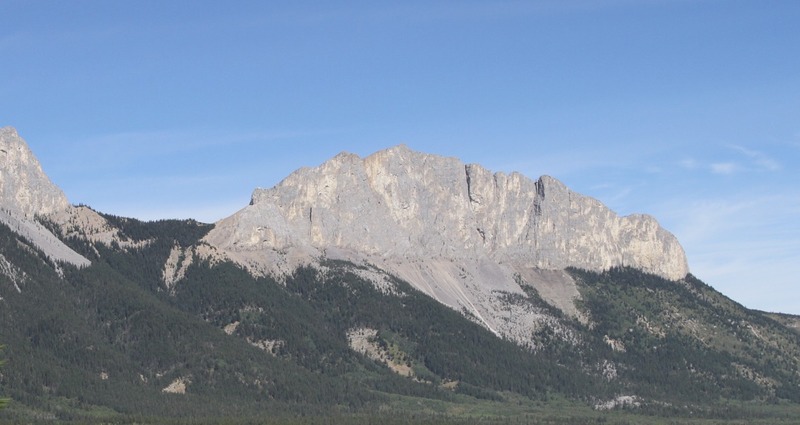 Cascade Mountain, Banff, with a gentle anticline of the Rundle formation at the peak underlain by the recessive Banff Formation, beneath which can be seen the cliff forming Palliser formation, all thrust up on the Rundle Thrust Fault. 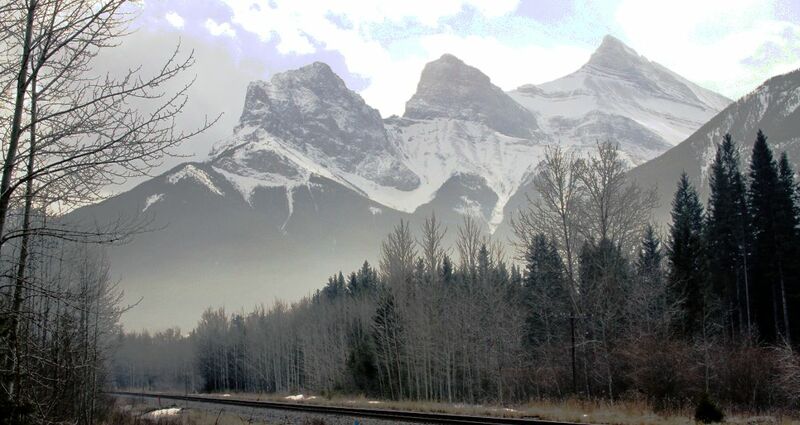 Passing Banff, the Sawback Range becomes visible on the right side of the highway. Its sharp peaks are rugged, but its lower slopes are smooth, as a result of glacier movement down the valley during the Wisconsinan glaciation. The maximum height of the glacial ice is seen where the peaks become rugged at an elevation of about 2,000m. These Cambro-Ordovician carbonate rocks are tilted almost vertically on the north-east side of the valley due to back rotation during the thrust faulting. The next major sight on the highway is the majestic Castle Mountain, where the Castle Mountain thrust fault is nearly flat below the tree line, putting Cambrian Eldon, Stephen Cathedral and Gog Formations, as well as Precambrian Miette, on top of younger Paleozoic carbonates of the front ranges. As we cross this fault we transition to the Main Ranges of the Rocky Mountains. 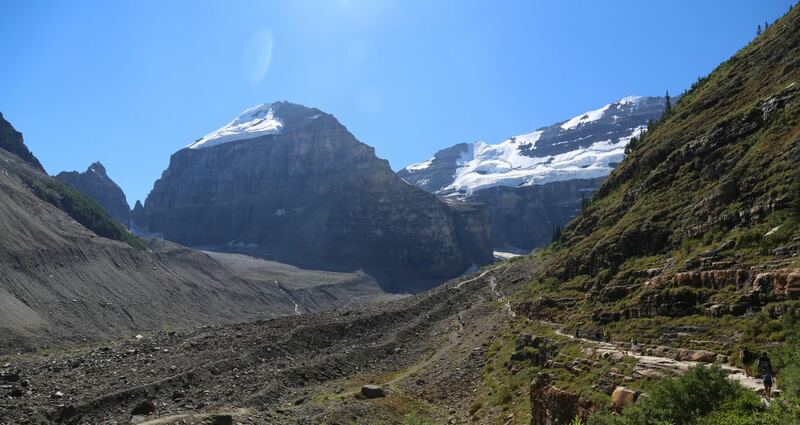 View of the hiking the trail to the Plain of Six Glaciers at Lake Louise, Alberta, showing large lateral moraines. Another view of the hiking the trail to the Plain of Six Glaciers at Lake Louise, Alberta. The bulky Cambro-Ordovician carbonates of Protection Mountain on the right side of the highway are seen about 50 km from Banff as we approach the Lake Louise area, and exhibit some slumps that occurred after the glacier scoured the valley. Nearing Lake Louise, Mt. Temple is visible on the left-hand side of the valley. It is the tallest mountain in the area, and is topped with rocks from the Eldon, Stephen, Cathedral and Mt. Whyte Formations, which overly a significant thickness of Gog Formation. Beautiful Lake Louise is the final destination, and it is advised to arrive as early as possible as the parking lots fill very quickly. A short walk gives you a view of the lake with Mt. Victoria and its glacier as the backdrop. As with Mt. Temple, the Eldon, Stephen, Cathedral, Mt. Whyte and Gog Formations dominate the area. Two nearby hikes are highly recommended and both destinations have a historic and rustic Teahut where food and beverages are served. 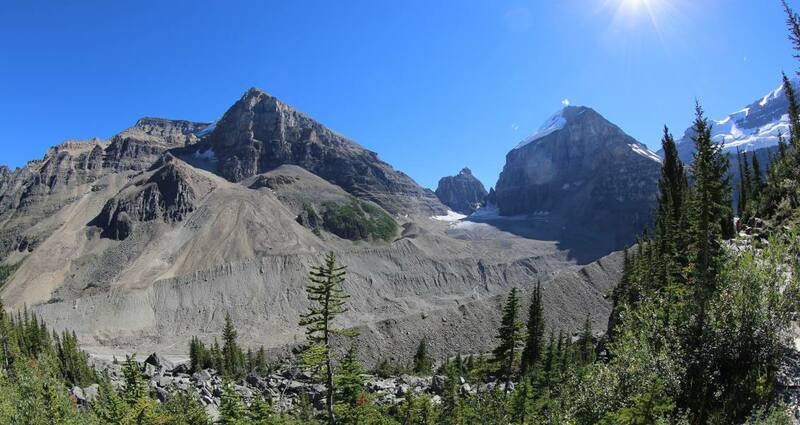 The hike to Lake Agnes and the Little Beehive offer great views of the Bow Valley, and the Plain of Six Glaciers allows up-close access to the length of lateral moraines of the receding Victoria Glacier. Eyles, N. and Miall, A., 2007. 'Canada Rocks, The Geologic Journey.' Fitzhenry and Whiteside. Gadd, B., 2008. 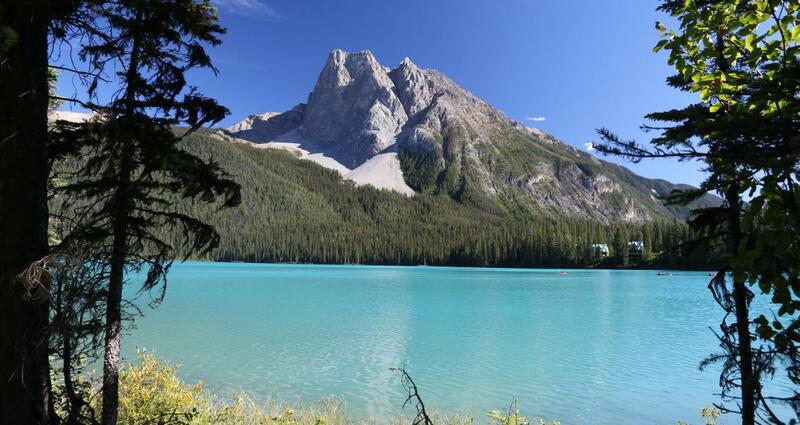 'Canadian Rockies, Geology Road Tours.' Corax Press. Hargreaves, Anne., 2013. 'Scenic Geology of the Icefields Parkway.' GEO ExPro, Vol. 10, No.2. Slanic Prahova, a small town in the centre of Romania, is famous as the home of the second biggest salt mine in Europe, the spectacular Salt Mountain, a natural reservation that is unique in the world.